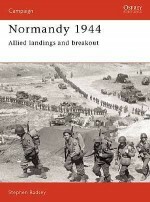 Steven Zaloga offers up a rigorous and absorbing study of the first major Allied operation in Normandy after the D-Day landings - the capture of Cherbourg. Blending expert analysis, specially commissioned artwork and illustrative maps, this book tells the story of the bitter struggle to capture this vital point. Cherbourg was recognized by both the German and Allied High commands as crucial to the Allied foothold in Normandy - it was the nearest major port and was desperately needed by the Allies for major logistical operations to support their forces on long stretches of open beach. Hitler, on the other hand, declared Cherbourg to be a 'Festung' (fortress), a designation everyone knew to mean that its defenders were to fight to the last man. After a grueling struggle that involved several distinct tactical phases to overcome the different elements of Cherbourg's defence, the campaign resulted in a bittersweet Allied victory, the drama and significance of which are explained in full in this work.